For a while I have been wondering why my energy has been lacking. I wondered if it was diet, stress, workload, exercise. Of course all of those things are factors, but I couldn’t put my finger on why it was so unusually bad right now. With the help of my iPhone I think I have found the culprit, or the largest. While I always knew my sleep paterns could be, well, less than optimal, I never expected to see a chart like this one. 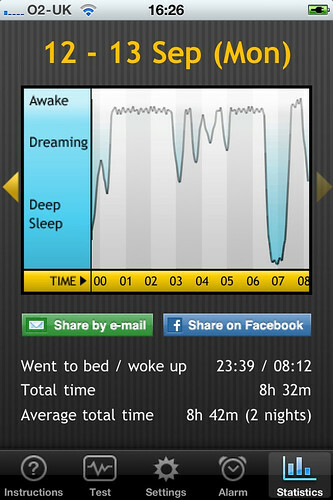 According to this, once I got to bed I had around 1 hour of actual deep sleep. We all know it is not so much how much time you spend in bed that counts but the quality of sleep you get while in there, and this shows mine isn’t so great. The application is called “Sleep Cycle” (find it in your app store) and uses the sensitive accelerometer in the iPhone to detect your movements and therefore sleep pattern. I don’t know how to read these charts but even I can tell this does not look as it should be. With lack of sleep we get lack of energy, stamina suffers and so does concentration. Peak productivity can’t be maintained while your body and mind are crying out for sleep. Of course I have a lot on my mind, what with projects and an immigration to worry about on top of the usual family/business/life stuff, but I am pretty sure my productivity will take a leap once I can fix or mitigate this sleep problem. Temperature – Too hot or too cold and I will never get decent sleep. No point in getting proper air conditioning only to leave it in the UK but I can bring up my portable office unit to see if that helps. Pillow – I have one of those curved, firm pillows that are supposed to offer more spine support. This needs to be examined to see if it is right for me. Timing – Sleep routine rather than random “keep working until I start nodding off at my desk” would probably help I am guessing! Brain – Turn off the brain well before attempting to go to sleep to stop the mind continuiing to work long after it should be dozing. Diet – Eating late or eating certain foods impacts sleep, as does excess or late caffiene/sugar intake. I practically live on coffee, and that needs to stop. Exercise – IE. get some. I started before our recent trip to Australia and quit while we were away. Use up that adrenalin for something positive. Daylight – IE. get some. Artificial glow from a computer screen is not a natural light substitute I am told. Strange that. We need sunlight to regulate our body clocks. What else can I try to improve my sleep? What has hurt or helped yours? Do you get enough sleep? Please share any thoughts you have in the comments …. You might not think “geek” is a lifestyle, but it really is. Being a geek seeps into every aspect of your daily life. You can’t switch it off, it is part of your DNA. Being a “geek” is much more than just a fondness for Science Fiction and gadgets, so much more.